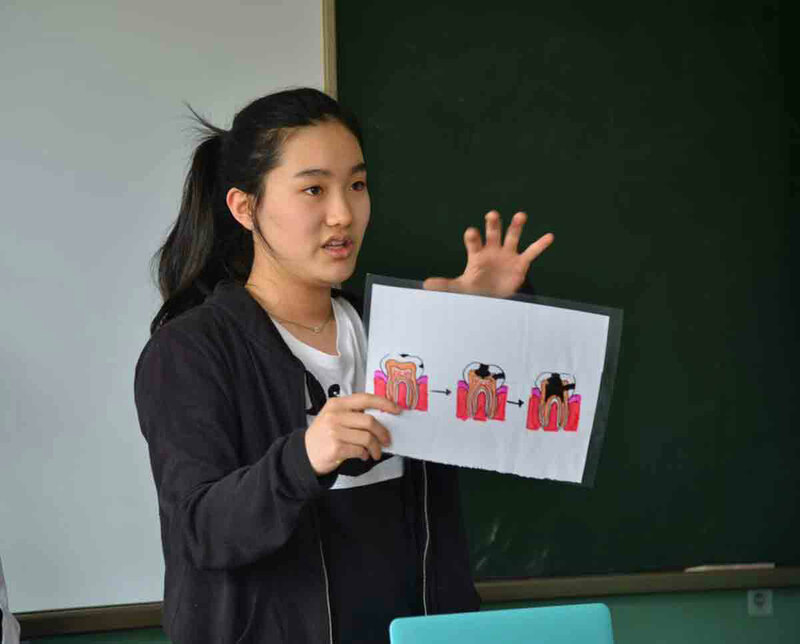 In the spring of 2017, Diana Y, a grade 9 student at the International School of Beijing (ISB), embarked on a trip to the town of Lishi in Shanxi province of China. She was very nervous on the ride – she was scheduled to speak in front of two different schools, and she is generally fairly shy. But she felt strongly about her purpose there, and when she arrived, she greeted the schools' administrators confidently. Diana had put together an ambitious oral health education program after learning that the issue was a major concern in the province. She'd used her own savings to purchase toothbrushes and toothpaste for the students she was visiting. Now she was in the driver's seat, implementing a plan that she'd designed in partnership with her instructors and an NGO that helped her learn the logistics of developing a sustainable program. The effort to give students this kind of agency is a very encouraging trend in education, especially among international schools. These institutions have a specified mandate to instil in their students a sense of global citizenship and service, and curriculum leaders around the world have enthusiastically adopted a service learning mantra for their students. When Diana spoke in front of the student bodies of two rural Chinese schools, she was living out this mantra. She overcame her own personal fears and made a meaningful impact on a part of the world that could benefit from her research and resources. "The biggest lesson I learned was the value of getting out of my comfort zone. When meetings were arranged with school principals in Lishi, I was originally reluctant because I was anxious about speaking," said Diana. "The amount of trust I received from kids and adults gave me a lot of confidence." This is the kind of experience that transcends a typical classroom education; it shapes the lives of both the student and the community with which they engage. ISB has been ambitious in its goals of embedding service learning throughout the curriculum. The school is devoted to an innovative approach to education it's dubbed L21 – short for Learning for the 21st Century. Teachers at ISB recognize that their students will not just need to pass exams to be successful – they will need to actively apply their knowledge and skills from a wide range of disciplines in projects that challenge them and force them to be decisive, courageous participants in society. ISB typifies the goals of many modern international schools. Service learning is no longer looked at as a luxury that can be pursued if all other bases are covered. It's being seen increasingly as a means through which to implement the standard curriculum. Many, like ISB, are even adding a service learning coordinator position to their staff. "Service learning is where the rubber meets the road in terms of students developing genuine empathy and being forced to consider who they are, and what they've got, and what their responsibilities are," according to Patrick Hurworth, Head of School at ISB. "It's transformative. The landscape is changing, but not quickly enough. It takes schools to be very bold about it. We can't just present those characteristics as something students acquire by accident. There needs to be a concerted effort." A service learning project isn't just a community service project. Within a rigorous curriculum like ISB's, it is a multi-tiered process of inquiry and investigation, planning, implementation, and assessment. It usually involves a detailed exhibition of plans, goals and results and is met with formal critiques from peers and faculty. There are often unmet goals or outright failures, but these are equally valued and assessed with effort and engagement in mind rather than results. In early grades, service learning projects can be toy drives or tree planting efforts, as long as an investigation into who can benefit and how best to meet those needs are involved. In later grades, the student takes the reins as much as possible in deciding the scope and goals of the project. In Diana's case, she originally wanted to pursue a project helping Syrian refugees, as she'd read a lot about their plight in the news. But when she learned that one of their biggest needs was oral health care, she dug deeper and learned that the same problem existed in rural China, including in her mother's hometown of Lishi. She adjusted her goals, made them more compact and arguably more impactful, and the program she instituted will live on past her involvement. "Students develop and fine-tune a whole range of skills such as planning, communication and time management," said Angela Fournier, one of ISB's CAS Coordinators (Creativity, Action, Service). "Additionally, they build confidence, fuel their passions and, in the best of cases, inspire others to do the same." Ideally, a successful service-learning program will make a high school curriculum more about what drives a student and makes them passionate rather than what they must do to meet academic requirements. This usually involves teachers and staff relinquishing a certain level of control, which can be a challenge both professionally and in students' performances. But with the engaged involvement of a service learning coordinator working in tandem with the curriculum staff and the faculty, these hurdles can be overcome. Service learning is an efficient means to accomplish every international school's goal of breaking through the walls of the school and engaging with their community and their region of the world in a meaningful, impactful way. The process of leading a project with real-world goals instils a level of self-respect and professionalism in young students that can fuel their ambitions and open up a new world of possibilities. To learn more about ISB's High School, click here.